If you would like to add a message along with your order, (e.g. :I would like 2 day shipping please call me with pricing.) 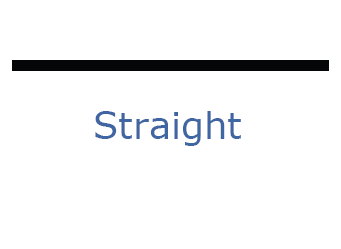 you may do so below. The drapery hardware kit contains one 24-inch x 1⅜” drapery rod for holding a stationary drapery panel (drape not included in the kit). The drapery rod is hung by mounting the two steel white powder coated ceiling hooks. The bottom of the hook hangs 3½" below the ceiling, therefore the top of the rod is just over 2" below the ceiling. One end of the drapery rod is drilled to accept a finial, although the use of a finial is optional. The drapery kit includes a plastic tieback mounting clip that can be either screwed into the wall or attached to tile using double sided mounting tape. 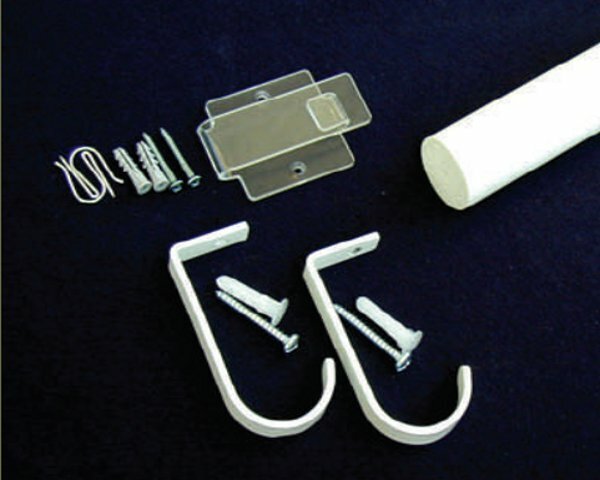 The needed screws, drywall anchors and drapery pins are also included. A printed copy of the Designer Drape Pattern to make the custom designer drape is also included in the kit. 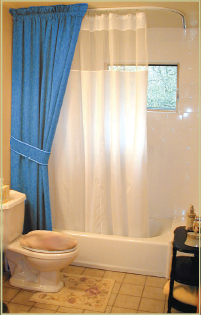 The pattern to make the drape can be downloaded (pdf file) for free from the home page. If you only need the drapery hooks they are sold separately for $15. 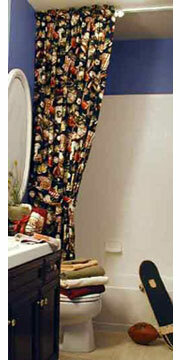 Below are examples of drapery panels that can be constructed using the Designer Drape Pattern.